"I remember my older sister Anita with her black hair, but I saw her now with her with her gray hair and all these other details," says one relative. 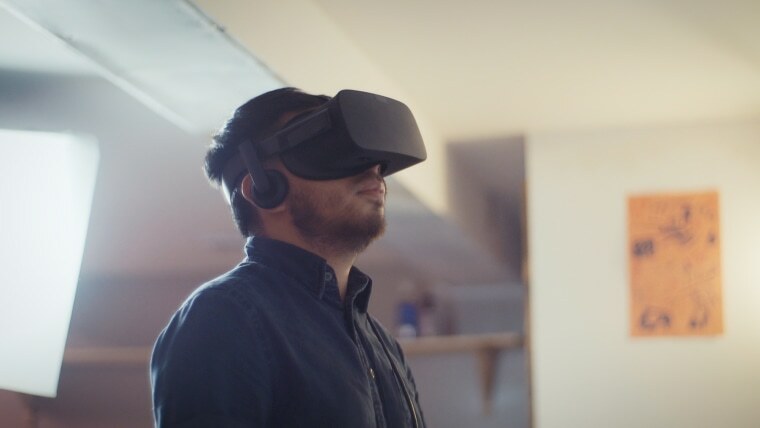 Alvaro Morales, 26, and Frisly Soberanis, 24, are the creators of the Family Reunions Project, an initiative that uses virtual reality, also known as VR, to "take" family members in the U.S. back to their homes and towns in Latin America through the use of immersive video. There are millions of immigrants in the U.S. who cannot leave the country because of their current immigration status and who have not been home in decades. Morales, a Peruvian-born former economic consultant and a graduate of Amherst College, originally came up with the idea after he showed his uncle a VR film. After watching it, his uncle told him he would give anything to have somebody film his home country so he could see it again. The interaction motivated Morales to quit his consulting job and partner up with Soberanis, a Guatemala-born video artist and a graduate of the Academy for Careers in TV and Film, to launch the project. Through grants and donations, primarily from the organization Immigrants Rising and their Fund for Undocumented Social Entrepreneurs (FUSE), the Family Reunions Project has been able to do over a dozen virtual family reunions for people like Maria, who did not want to publish her last name due to her immigration status. She came from Arequipa, Perú over 20 years ago and still remembered the last time she hugged her siblings and mother. When Maria's son, Nicolás, first learned about the project, she said he jumped out of bed to tell her that she might have a chance to see her family back in Perú without having to travel and risk not being able to return to the U.S.
Once Maria decided to participate in the project, Morales flew to Arequipa and filmed her family, their daily lives and the town where she grew up. Once back, both Soberanis and Morales recreated those moments for María to see through a VR headset. “I've seen their faces, I can recognize how they look now with their gray hairs. I remember my older sister Anita with her black hair, but I saw her now with her gray hair and all these other details," said a happy and emotional Maria. "The town is more beautiful now, more developed." Soberanis and Morales say they understand how these immigrant families feel; they came to the U.S. as young children. Though they don't have legal status, they can travel and work under the Deferred Action for Childhood Arrivals program, known as DACA, the Obama-era program that allows young undocumented immigrants who qualify to work and study in the U.S. without fear of deportation. “Both of us being undocumented, we knew the pain, we knew the separation and we knew how much our parents would really enjoy looking at home,” said Soberanis. According to Morales, the Family Reunions Project is innovative because it breaks with the assumption that VR technology is just for gamers and entertainment. And though the topic of immigration has been so polarizing politically, Morales hopes that technology can help humanize the issue. “There are very few projects kind of exploring who really needs this [virtual] transportation,” said Morales. He said this is apparent when you see an immigrant family member with a headset on, trying to hug or speaking to someone they're watching on video. "It's always really tough, but it's powerful," said Morales.